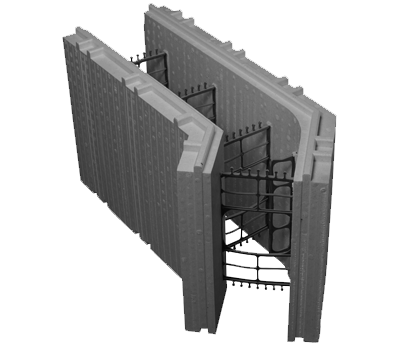 The 6 inch 45 degree corner block allows you design freedom to create unique angles in your ICF walls. You can create both inside and outside angles to fit the design of your foundation or walls. These angle blocks make up an average of 1-5% of the Advantage ICF wall assemblies in residential and commercial construction. With 5 specially designed webs molded into the EPS block, these 16.5 inch high ICFs provide strong, secure angles. Using the Advantage patented interlock system the blocks are secured together in each course creating the angled wall that aligns with the straight blocks in the surrounding assembly. Each 6” angled block is 16.5” high, 11.25” thick, and two lengths of “legs” 9.375" x 25.375", and 4.75" x 20.75"